Though it kicked off with the same Earth-90 teaser that’s haunted fans all of last week, “Elseworlds, Part 1” did not answer any of the burning questions about who exactly The Monitor (LaMonica Garrett) is or why exactly he is systematically decimating worlds when they fail his strange test. Instead The Flash jumped straight into the next test, this time of Earth-1, with Eugenics freak Dr. John Deegan (Jeremy Davies) placed in charge of a strange book and told to remake history with us. And thus began the funniest Arrowverse crossover yet, which focused on Barry (Grant Gustin) and Oliver (Stephen Amell) switching places. Patton can create chemistry with anyone. 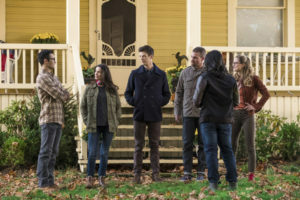 The producers previously stated that since they couldn’t go any bigger in scale, they instead wanted the “Elseworlds” crossover to dive deeper on an emotional level. The first hour managed to do that for Oliver and Barry specifically, by using their Quantum Leap-esque scenario to draw out what they viewed as their – and each other’s – shortcomings. Fans of the respective shows already know that Barry loves pep talks and thumb rubs while Oliver tends to see the dark side of everything, but it was interesting to see Oliver express jealousy over Barry’s ability to use his powers joyfully and to give that a try himself. Barry, on the other hand, had to bring out a little of the darkness in himself and instead struggled with not losing himself to it as Oliver often had in the past. 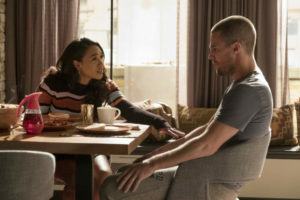 One of the reasons Barry was always able to pull himself back in the past was Iris (Candice Patton) and her love, which played an integral role in The Flash portion of “Elseworlds” despite inexplicably disappearing in the next two so that the network can avoid giving the actress an extra paycheck. Her early moments with Oliver-as-Barry in the episode where hysterical, with her playing the concerned and doting wife scenes straight while Amell stretched his comedic muscles by freaking out inside. But once the real Barry Allen showed up, her resolve began to waver and the unbreakable bond between them came to light once more. Patton and Gustin’s chemistry is incredibly versatile, so they pulled off the new scenario impeccably – it’s just a shame that the last two crossovers have only seen fit to use her as Barry’s “lightning rod” and not as a reporter in her own right. “Somebody Save (Them)” by Remy Zero. Speaking of reporters, Lois Lane (guest star Bitsie Tulloch) made her first appearance in “Elseworlds” and enjoyed a few adorable moments with her boyfriend Clark (Tyler Hoechlin) and super-friend Kara (Melissa Benoist). Two minutes of screentime as the boys traveled to Earth-38 for help were not enough to fully establish her character, but she played off the other actors well and showcased the fire and grit that any Lois worth her salt should have. It was really Benoist who got to have the most fun on Earth-38, though, poking fun at both Oliver and Barry as she tried to coach them into acting more like each other in order to tap into their particular skill sets. While the crossover seemed to be more of a buddy hero comedy in which only boys were allowed, hopefully Kara and eventually Kate will have meatier stories to tackle in the next two nights. Cisco (Carlos Valdes) was also present in “Elseworlds,” mostly for touchy-feely team laughs that would discombobulate Oliver and exposition in the face of an evil robot named AMAZO set to copy everyone’s powers and destroy the Earth. He and Iris were the only two The Flash characters that part one of the crossover really incorporated, and while they didn’t get enough to do they did get some of the best lines and scenes of the night. As for the AMAZO robot itself, he wasn’t anything to write home about visually but it was indeed a treat to see four of the Arrowverse’s biggest heroes fighting alongside each other – even though two of them were switched. “Elseworlds” had a few logical flaws, leaving us wondering why The Monitor would hand his weapon of Earth destruction to a sadsack mad scientist, or why that scientist’s new world seemed exactly the same except for red skies and two heroes in two different cities living each other’s lives, but it was undeniably fun. If the next two parts can keep up the same tone and expand the life lessons to more than just the two white knights, the CW might come away with its most enjoyable crossover yet.